This invention provides polyvalent or polyspecific protein complexes, comprising three or more polypeptides which associate to form three or more functional target-binding regions (TBRs), and in which each individual polypeptide comprises two or more immunoglobulin-like domains which are covalently joined together, such that two Ig-like domains in a single polypeptide do not associate with each other to form a TBR. By using a linker peptide of fewer than three amino acid residues the immunoglobulin-like domains of the individual polypeptides are prevented from associating, so that complex formation between polypeptides is favoured. Preferably the polyvalent or polyspecific protein is a trimer or tetramer. The proteins of the invention have specificities which may be the same or different, and are suitable for use as therapeutic, diagnostic or imaging agents. Antibody genes or fragments thereof can be cloned and expressed in  E. coli in a biologically functional form. Antibodies and antibody fragments can also be produced by recombinant DNA technology using either bacterial or mammalian cells. The hapten- or antigen-binding site of an antibody, referred to herein as the target-binding region (TBR), is composed of amino acid residues provided by up to six variable surface loops at the extremity of the molecule. These loops in the outer domain (Fv) are termed complementarity-determining regions (CDRs), and provide the specificity of binding of the antibody to its antigenic target. This binding function is localised to the variable domains of the antibody molecule, which are located at the amino-terminal end of both the heavy and light chains. This is illustrated in FIG. 1. The variable regions of some antibodies remain non-covalently associated (as V HVL dimers, termed Fv regions) even after proteolytic cleavage from the native antibody molecule, and retain much of their antigen recognition and binding capabilities. Methods of manufacture of Fv region substantially free of constant region are disclosed in U.S. Pat. No. 4,642,334. The construction of scFv libraries is disclosed for example in European Patent Application No. 239400 and U.S. Pat. No. 4,946,778. However, single-chain Fv libraries are limited in size because of problems inherent in the cloning of a single DNA molecule encoding the scFv. Non-scFv libraries, such as V H or Fab libraries, are also known (Ladner and Guterman WO 90/02809), and may be used with a phage system for surface expression (Ladner et al WO 88/06630 and Bonnert et al WO 92/01047). This specification did not predict that scFv-0 constructs in which the C-terminus of one V domain is ligated to the N-terminus of another domain, and therefore lack a foreign linker polypeptide, would form trimers. In contrast, it was suggested that, like constructs incorporating a linker, they would form dimers. A trimeric Fab′ fragment formed by chemical means using a tri-maleimide cross-linking agent, referred to as tri-Fab, has been described (Schott et al, 1993 and Antoniw et al, 1996). These tri-Fab molecules, also termed TMF, have been labelled with  90Y as potential agents for radioimmunotherapy of colon carcinoma, and have been shown to have superior therapeutic effects and fewer side-effects compared to the corresponding IgG. This was thought to result from more rapid penetration into the tumour and more rapid blood clearance, possibly resulting from the nature of the cross-linked antibody fragment rather than merely the lower molecular weight (Antoniw et al, 1996). However, these authors did not examine the affinity or avidity of either the IgG or the TMF construct. Recombinant single chain variable fragments (scFvs) of antibodies, in which the two variable domains V H and VL are covalently joined via a flexible peptide linker, have been shown to fold in the same conformation as the parent Fab (Kortt et al, 1994; Zdanov et al, 1994;see FIG. 19a). ScFvs with linkers greater than 12 residues can form either stable monomers or dimers, and usually show the same binding specificity and affinity as the monomeric form of the parent antibody (WO 31789/93, Bedzyk et al, 1990; Pantoliano et al, 1991), and exhibit improved stability compared to Fv fragments, which are not associated by covalent bonds and may dissociate at low protein concentrations (Glockshuber et al, 1990). ScFv fragments have been secreted as soluble, active proteins into the periplasmic space of E. coli (Glockshuber et al, 1990; Anand et al, 1991). Various protein linking strategies have been used to produce bivalent or bispecific scFvs as well as bifunctional scFv fusions, and these reagents have numerous applications in clinical diagnosis and therapy (see FIGS. 19 b-d). The linking strategies include the introduction of cysteine residues into a scFv monomer, followed by disulfide linkage to join two scFvs (Cumber et al, 1992; Adams et al, 1993; Kipriyanov et al, 1994; McCartney et al, 1995). Linkage between a pair of scFv molecules can also be achieved via a third polypeptide linker (Gruber et al, 1994; Mack et al, 1995; Neri et al, 1995; FIG. 19b). Bispecific or bivalent scFv dimers have also been formed using the dimerisation properties of the kappa light chain constant domain (McGregor et al, 1994), and domains such as leucine zippers and four helix-bundles (Pack and Pluckthun, 1992; Pack et al, 1993, 1995; Mallender and Voss, 1994; FIG. 19c). Trimerization of polypeptides for the association of immunoglobulin domains has also been described (International Patent Publication No. WO 95/31540). Bifunctional scFv fusion proteins have been constructed by attaching molecular ligands such as peptide epitopes for diagnostic applications (International Patent Application No. PCT/AU93/00228 by Agen Limited; Lilley et al, 1994; Coia et al, 1996), enzymes (Wels et al, 1992; Ducancel et al, 1993), streptavidin (Dubel et al, 1995), or toxins (Chaudhary et al, 1989, 1990; Batra et al, 1992; Buchner et al, 1992) for therapeutic applications. In the design of scFvs, peptide linkers have been engineered to bridge the 35 A distance between the carboxy terminus of one domain and the amino terminus of the other domain without affecting the ability of the domains to fold and form an intact binding site (Bird et al, 1988; Huston et al, 1988). The length and composition of various linkers have been investigated (Huston et al, 1991) and linkers of 14-25 residues have been routinely used in over 30 different scFv constructions, (WO 31789/93, Bird et al, 1988; Huston et al, 1988; Whitlow and Filpula, 1991; PCT/AU93/00491; Whitlow et al, 1993, 1994). The most frequently used linker is that of 15 residues (Gly 4Ser)3 introduced by Huston et al (1988), with the serine residue enhancing the hydrophilicity of the peptide backbone to allow hydrogen bonding to solvent molecules, and the glycyl residues to provide the linker with flexibility to adopt a range of conformations (Argos, 1990). These properties also prevent interaction of the linker peptide with the hydrophobic interface of the individual domains. Whitlow et al (1993) have suggested that scFvs with linkers longer than 15 residues show higher affinities. In addition, linkers based on natural linker peptides, such as the 28 residue interdomain peptide of Trichoderma reesi cellobiohydrolase I, have been used to link the VH and VL domains (Takkinen et al, 1991). A scFv fragment of antibody NC10 which recognises a dominant epitope of N9 neuraminidase, a surface glycoprotein of influenza virus, has been constructed and expressed in  E. coli (PCT/AU93/00491; Malby et al, 1993). In this scFv, the VH and VL domains were linked with a classical 15 residue linker, (Gly4 Ser)3, and the construct contained a hydrophilic octapeptide (FLAG™) attached to the C-terminus of the VL chain as a label for identification and affinity purification (Hopp et al, 1988). The scFv-15 was isolated as a monomer which formed relatively stable dimers and higher molecular mass multimers on freezing at high protein concentrations. The dimers were active, shown to be bivalent (Kortt et al, 1994), and reacted with soluble N9 neuraminidase tetramers to yield a complex with an Mr of 600 kDa, consistent with 4 scFvs dimers cross-linking two neuraminidase molecules. Crystallographic studies on the NC10 scFv-15 monomer-neuraminidase complex showed that there were two scFv-neuraminidase complexes in the asymmetric unit and that the C-terminal ends of two VH domains of the scFv molecules were in close contact (Kortt et al, 1994). This packing indicated that VH and VL domains could be joined with shorter linkers to form stable dimeric structures with domains pairing from different molecules and thus provide a mechanism for the construction of bispecific molecules (WO 94/13804, PCT/AU93/00491; Hudson et al, 1994, 1995). Reduction of the linker length to shorter than 12 residues prevents the monomeric configuration and forces two scFv molecules into a dimeric conformation, termed diabodies (Holliger et al, 1993, 1996; Hudson et al, 1995; Atwell et al, 1996; FIG. 19 d). The higher avidity of these bivalent scFv dimers offers advantages for tumour imaging, diagnosis and therapy (Wu et al,. 1996). Bispecific diabodies have been produced using bicistronic vectors to express two different scFv molecules in situ, VHA-linker-VLB and VHB-linker-VLA, which associate to form the parent specificities of A and B (WO 94/13804; WO 95/08577; Holliger et al, 1996; Carter, 1996; Atwell et al, 1996). The 5-residue linker sequence, Gly4Ser, in some of these bispecific diabodies provided a flexible and hydrophilic linker. ScFv-0 V H-VL molecules have been designed without a linker polypeptide, by direct ligation of the C-terminal residue of VH to the N-terminal residue of VL (Holliger et al, 1993, McGuiness et al, 1996). These scFv-0 structures have previously been thought to be dimers. We have now discovered that NC10 scFv molecules with V H and VL domains either joined directly together or joined with one or two residues in the linker polypeptide can be directed to form polyvalent molecules larger than dimers and in one aspect of the invention with a preference to form trimers. We have discovered that the trimers are trivalent, with 3 active antigen-combining sites (TBRs; target-binding regions). We have also discovered that NC10 scFv molecules with VL domains directly linked to VH domains can form tetramers that are tetravalent, with 4 active antigen-combining sites (TBRs). We initially thought that these trimeric and tetrameric conformations might result from steric clashes between residues which were unique to the NClOscFv, and prevented the dimeric association. However, we have discovered that a second scFv with directly linked V H-VL domains, constructed from the monoclonal anti-idiotype antibody 11-1G10, is also a trimer and is trivalent, with 3 active TBRs. The parent antibody, murine 11-1G10, competes for binding to the murine NC41 antibody with the original target antigen, influenza virus N9 neuraminidase (NA) (Metzger and Webster, 1990). We have also discovered that another scFv with directly linked VH-VL domains (C215 specific for C215 antigen) is also a trimer. We now propose that the propensity to form polyvalent molecules and particularly trimers is a general property of scFvs with V H and VL domains either joined directly together or joined with one or two residues in the linker polypeptide, perhaps due to the constraints imposed upon V-domain contacts for dimer formation. It will be appreciated by those skilled in the art that the polyvalent molecules can be readily separated and purified as trimers, tetramers and higher multimers. In a first aspect the invention provides a trimeric protein comprising three identical polypeptides, each of which comprises immunoglobulin V H and VL domains which are covalently joined preferably without a polypeptide linker, in which the peptides associate to form a trimer with three active TBRs, each of which is specific for the same target molecule. In a second aspect the invention provides a trimeric protein comprising three different polypeptides, each of which comprises antibody V H and VL domains or other immunoglobulin domains, which are covalently joined preferably without a polypeptide linker, in which the polypeptides associate to form a trimer with three active TBRs directed against three different targets. 1) Three identical V H-VL molecules (scFv×3)which are inactive as monomers but which form active trimers with 3 (identical) antigen combining sites (TBRs). 2) Three different V H-VL molecules (scFv×3) which are inactive as monomers but which form active trimers with 3 different antigen combining sites (TBRs). In a third aspect the invention provides a tetrameric protein comprising four identical polypeptides, each of which comprises immunoglobulin V H and VL domains which are covalently joined preferably without a polypeptide linker, in which the peptides associate to form a tetramer with four active TBRs each with specificity to the same target molecule. In a fourth aspect the invention provides a tetrameric protein comprising four different polypeptides each of which comprises antibody V H and VL domains or other immunoglobulin domains, which are covalently joined preferably without a polypeptide linker, in which the polypeptides associate to form a tetramer with four active TBRs directed against four different targets. For the purposes of this specification it will be clearly understood that the word “comprising” means “including but not limited to”, and that the word “comprises” has a corresponding meaning. FIG. 1 also shows a schematic representation of intact IgG, and its Fab and Fv fragments, comprising V H and VL domains associated to form the TBR; for both the intact IgG and Fab the CH1 and CL domains are also shown as ovals which associate together. Also shown are Fab molecules conjugated into a polyvalent reagent either by Celltech's TFM chemical cross-linker or by fusion to amphipathic helices with adhere together. A monomeric scFv molecule is shown in which the VH and VL domains are joined by a linker of at least 12 residues (shown as a black line). Dimers are shown as bivalent scFv2 (diabodies) with two identical VH-L-VL molecules associating to form two identical TBRs (A), and bispecific diabody structures are shown as the association of two VH-L-VL molecules to form two different TBRs (A,B) and where the polypeptide linker (L) is at least 4 residues in length. Aspect 1 of the invention is shown as a trivalent scFv3 (triabody) in which three identical VH-VL molecules associate to form three identical TBRs (A) and where the V-domains are directly ligated together preferably without a polypeptide linker sequence. Aspect 2 of the invention is depicted as a trispecific triabody with association of three VH-VL molecules to form three different TBRs (A,B,C). Aspects 3,4 of the invention are shown as a tetravalent ScFv4 tetramer (tetrabody) and a tetraspecific tetrabody with association of four identical or different scFv molecules respectively and in which the V-domains are directly ligated together preferably without a polypeptide linker sequence. FIG. 2 shows a ribbon structure model of the NC10 scFv-0 trimer constructed with circular three-fold symmetry. The three-fold axis is shown out of the page. The V H and VL domains are shaded dark grey and light grey, respectively. CDRs are shown in black, and the peptide bonds (zero residue linkers) joining the carboxy terminus of VH to the amino terminus of the VL in each single chain are shown with a double line. Amino (N) and carboxy (C) termini of the VH (H) and VL (L) domains are labelled. FIG. 3 shows a schematic diagram of the scFv expression unit, showing the sequences of the C-terminus of the V H domain (residues underlined), the N-terminus of the VL domain (residues underlined) and of the linker peptide (bold) used in each of the NC10 scFv constructs. FIG. 6 shows the results of SDS-PAGE comprising affinity-purified NC10 scFvs with the V H and VL domains joined by linkers of different lengths. ScFv-0 shows two lower molecular mass bands of ˜14 kDa and 15 kDa (arrowed), corresponding to the VH and VL domains produced by proteolytic cleavage of the scFvs during isolation, as described in the text. The far right lane shows the monomer peak (Fv) isolated from the scFv-0 preparation (left lane) by gel filtration. FIG. 7 shows the results of size exclusion FPLC of affinity purified NC10 scFvs on a calibrated Superdex 75 HR10/30 column (Pharmacia). The column was calibrated as described previously (Kortt et al, 1994). Panel a shows that the scFv-15 contains monomer, dimer and some higher M r multimers. Panel b shows the scFv-10, containing predominantly dimer, and Panel c shows the scFv-0 eluting as a single peak with Mr of ˜70 kDa. The column was equilibrated with PBS, pH 7.4 and run at a flow rate of 0.5 ml/min. d) the scFv-0 binding three anti-idiotype Fab′ fragments to form a complex of M r 212 kDa. FIG. 9 shows sedimentation equilibrium data for complexes of anti-idiotype 3-2G12 Fab′ and NC10 scFv-15 monomer, scFv-5 dimer and scFv-0 trimer. The complexes were isolated by size exclusion chromatography on Superose 6 in 0.05 M sodium phosphate, 0.15 M NaCl, pH 7.4. Experiments were conducted at 1960 g at 20° C. for 24 h using double sector centrepiece and 100  11 sample. The absorbance at 214 nm was determined as a function of radius in cm. Data for the complexes of anti-idiotype 3-2G12 Fab′ with scFv-15 monomer (A), scFv-5 ( ) and scFv-0 (0) are shown. FIG. 13 shows the results of size exclusion FPLC on a calibrated Superdex 75 HR 10/30 column (Pharmacia), showing overlaid profiles of 11-1G10 scFv-15 monomer and scFv-0 trimer with peaks eluting at times corresponding to Mr ˜27 kDa and ˜85 kDa respectively. The column was equilibrated with PBS (pH 7.4) and run at a flow rate of 0.5 ml/min. d) X-shaped tetramers; NC10 V L-VH scFv-0 tetramer/3-2G12 Fab complex. FIG. 17 shows the analysis of affinity-purified NC10 scFv-0 (V L-VH) on a Superose 12 10/30 HR (Pharmacia) column. Panel a) shows the profile for the affinity purified scFv on a single Superose 12 column equilibrated in PBS pH 7.4 and run at a flow rate of 0.5 ml/min. The scFv-0 contains two components. Panel b) shows the separation of the two components in the affinity-purified scFv-0 preparation on two Superose 12 columns joined in tandem to yield a scFv-0 tetramer (Mr ˜108 kDa) and a scFv-0 trimer (Mr˜78 kDa). The tandem columns were equilibrated in PBS, pH 7.4 and run at a flow rate of 0.3 ml/min. The peaks were pooled as indicated by the bars for complex formation with 3-2G12 antibody Fab′ used for EM imaging. Panel c) shows the profile for the rechromatography of the isolated scFv-0 tetramer from panel b on the tandem Superose columns under the conditions used in panel b. FIG. 18 shows the size exclusion FPLC analysis of affinity-purified C215 scFv-0 (V H-VL) on a Superose 12 10/30 HR column (Pharmacia) equilibrated in PBS pH 7.4 and run at a flow rate of 0.5 ml/min. A: An scFv comprising V H-L-VL where L is a linker polypeptide as described by Whitlow et al and WO 93/31789; by Ladner et al, U.S. Pat. No. 4,946,778 and WO 88/06630; and by McCafferty et al (1991) and by McCartney et al. (1995). B: A single polypeptide V H-L1-VL-L2-VH-L3-VL which forms two scFv modules joined by linker polypeptide L2, and in which the VH and VL domains of each scFv module are joined by polypeptides L1 and L3 respectively. The design is described by Chang, AU-640863. C: Two scFv molecules each comprising V H-L1-VL-L2(a,b), in which the VH and VL domains are joined by linker polypeptide L1 and the two scFv domains are joined together by a C-terminal adhesive linkers L2a and L2b. The design is described by Pack et al, PI-93-258685. D: The design of PCT/AU93/00491, clearly different to A, B and C above. A single scFv molecule V H-L-VL comprises a shortened linker polypeptide L which specifically prevents formation of scFvs of the type A, B or C, and instead forces self-association of two scFvs into a bivalent scFv dimer with two antigen combining sites (target-binding regions; TBR-A). The association of two different scFv molecules will form a bispecific diabody (TBRs-A,B). The BIAcore m biosensor (Pharmacia Biosensor AB, Uppsala Sweden), which uses surface plasmon resonance detection and permits real-time interaction analysis of two interacting species (Karlsson et al, 1991; Jonsson et al, 1993), was used to measure the binding kinetics of the different NC10 scFvs. Samples for binding analyses were prepared for each experiment by gel filtration on Superdex 75 or Superose 12 to remove any cleavage products or higher molecular mass aggregates which may have formed on storage. The kinetic constants, k a and kd, were evaluated using the BIAevaluation 2.1 software supplied by the manufacturer, for binding data where the experimental design correlated with the simple 1:1 interaction model used for the analysis of BIAcore™ binding data (Karlsson et al, 1994). Construct Complementary Oligonucleotide Pair NO. These duplexes were ligated into BstEII-SacI restricted pPOW NC10 scFv plasmid using an Amersham ligation kit. The ligation mixture was purified by phenol/chloroform extraction, precipitated with ethanol in the usual manner, and transformed into  E. coli DH5α (supE44, hsdR17, recA1, endA1, gyrA96, thi-1, re1A1) and LE392 (supE44, supF58, hsdR14, lacyl, galK2, galT22, metB1, trpR55). Recombinant clones were identified by PCR screening with oligonucleotides directed to the pelB leader and FLAG sequences of the pPOW vector. The DNA sequences of the shortened linker regions were verified by sequencing double-stranded DNA using Sequenase 2.0 (USB). The new NC10 scFv gene constructs, in which the V H and VL domains were linked with linkers of 10 ((Gly4Ser)2), 5 (Gly4Ser) and zero residues, are shown in FIG. 3. DNA sequencing of the new constructs confirmed that there were no mutations, and that the VH and VL domains were joined by the shorter linker lengths as designed. These constructs are referred to herein as NC10 scFv-10, scFv-5 and scFv-0, where the number refers to the number of residues in the linker. The purity of the scFvs was monitored by SDS-PAGE and Western blot analysis as described previously (Kortt et al, 1994). The concentrations of the scFv fragments were determined spectrophotometrically using the values for the extinction coefficient (ε 0.1%) at 280 nm of 1.69 for scFv-15, 1.71 for scFv-10, 1.73 for scFv-5 and 1.75 for scFv-0 calculated from the protein sequence as described by Gill and von Hippel (1989). Soluble NC10 scFv-10, scFv-5 and scFv-0 fragments were each purified using a two step procedure involving gel filtration and affinity chromatography after extraction of the  E. coli membrane fraction with 6 M guanidine hydrochloride, and dialysis to remove denaturant. The solubilised protein obtained was first chromatographed on Sephadex G-100 gel filtration to resolve three peaks (peaks 1-3, as shown in FIG. 4) from a broad low-molecular mass peak. SDS-PAGE and Western blot analysis of fractions across peaks 1-3 showed the presence of scFv-0 in peaks 1 and 2 (fractions 19-30, as shown in FIG. 5), with most of the scFv in peak 2. In contrast, in a previous report the expression of NC10 scFv-15 resulted in most of the scFv-15 being recovered from peak 3 as a monomer (Kortt et al, 1994). Affinity chromatography of peak 2 from FIG. 4 on an anti-FLAG M2™ Sepharose column yielded essentially homogeneous scFv-0 preparations with a major protein band visible at ˜27 kDa by SDS-PAGE analysis (FIG. 5); the decreasing size of the linker in the NC10 scFv-15,-10,-5 and -0 constructs is apparent from the mobility of the protein bands (FIG. 6). ScFv-5 and scFv-0 also contained a small component of the protein as a doublet at ˜14 and ˜15 kDa (FIG. 6), of which the 14 kDa band reacted with the anti-FLAG M2 antibody on Western blotting, consistent with proteolysis in the linker region between the VH and VL-FLAG domains. Affinity chromatography of the Sephadex G-100 peak 1 from FIG. 4 of NC 10 scFv-10 and scFv-5 on an anti-FLAG™ M2 antibody column yielded scFv preparations which were aggregated; attempts to refold or dissociate the aggregates with ethylene glycol (Kortt et al, 1994) were unsuccessful. This material was not only aggregated, but was probably misfolded as it showed no binding activity to N9 neuraminidase or the anti-idiotype 3-2G12 Fab′. All subsequent analyses were performed on scFvs isolated from Sephadex G-100 peak 2. * Molecular mass estimated by gel filtration on Superdex 75 in 0.05 M phosphate, 0.15 M NaCl, pH 7.4 at a flow rate of 0.5 ml/min at 20° C. The molecular masses of the complexes were calculated using a M r of 50,000 for the Fab′ and 190,000 for tern N9 neuraminidase. The molecular masses of 54 and 52.4 kDa, respectively, for scFv-10 and scFv-5 confirmed that they were dimers. The molecular mass of 69 kDa determined for the NC10 scFv-0 suggested that it was a trimer composed of three scFv-0 chains, but this molecular mass is lower than expected for such a trimer (calculated M r of 78 kDa). Analysis of the sedimentation data gave linear ln c versus r2 plots (Van Holde, 1975), indicating that under the conditions of the experiment scFv-5 dimer and scFv-0 trimer showed no dissociation. Furthermore, the sedimentation equilibrium results did not indicate a rapid equilibrium between dimer and trimer species to account for this apparently low molecular mass for NC10 scFv-0 trimer. N-terminal analysis of the two bands from the Fv fragment produced during the isolation of the NC10 scFv-0 (FIG. 6) also confirmed that the 15 kDa band was the V H domain and that the 14 kDa band had the N-terminal sequence of V S D I E L T Q T T, indicating that a small amount of proteolysis had occurred at the penultimate bond (T-V) in the C-terminal sequence of the VH domain (FIG. 3). Influenza virus neuraminidase, a surface glycoprotein, is a tetrameric protein composed of four identical subunits attached via a polypeptide stalk to a lipid and matrix protein shell on the viral surface (Colman, 1989). Intact and active neuraminidase heads (M r 190 kDa) are released from the viral surface by proteolytic cleavage in the stalk region (Layer, 1978). The four subunits in the neuraminidase tetramer are arranged such that the enzyme active site and the epitope recognised by NC10 antibody are all located on the upper surface of the molecule (distal from the viral surface). This structural topology permits the binding in the same plane of four NC10 scFv-15 monomers or four Fab fragments (Colman et al, 1987; Tulip et al, 1992) such that the tetrameric complex resembles a flattened box or inverted table with the neuraminidase as the top and the four Fab fragments projecting as the legs from the plane at an angle of 45°. This suggests that a bivalent molecule may be able to cross-link two neuraminidase tetramers to form a ‘sandwich’ type complex (FIG. 8a; Tulloch et al, 1989). Size-exclusion FPLC on a calibrated Superose 6 column showed that both the NC10 scFv-10 (FIG. 7) and NC10 scFv-5 dimers formed stable complexes with soluble neuraminidase with apparent molecular masses of approximately 600 kDa. The more accurate molecular mass determined by sedimentation equilibrium analysis for the scFv-10 and scFv-5-neuraminidase complexes was 596 kDa (Table 2). This complex M r is consistent with four scFv dimers (each 52 kDa) cross-linking two neuraminidase molecules (each 190 kDa) in a ‘sandwich’ complex, as illustrated schematically in FIG. 8a, and demonstrates that the scFv-10 and scFv-5 dimers are bivalent. Gel filtration of the isolated 600 kDa NC10 scFv-10-neuraminidase complex showed that it was extremely stable to dilution, with only a small amount of free neuraminidase and NC10 scFv-10 appearing when complex at a concentration of 2 nM was run on the Superose 6 column. The linearity of the ln c versus r 2 plots (Van Holde, 1975) of the sedimentation data, demonstrated in Example 3, showed that both complexes were homogeneous with respect to molecular mass and indicated that discrete and stoichiometric complexes were formed. Complex formation with different molecular ratios of scFv to neuraminidase (from 1:4 to 8:1) yielded only the 600 kDa complex. Interestingly, complexes with 4 scFv dimers binding to 1 neuraminidase (˜400 kDa) or aggregated complexes in which more than two neuraminidases were cross-linked were not observed. Size exclusion FPLC on Superose 6 showed that anti-idiotype 3-2G12 Fab′ formed stable complexes with NC10 scFv-15 monomer, NC10 scFv-5 and NC10 scFv-0. Sedimentation equilibrium analyses of the isolated complexes gave molecular masses consistent with the scFv-15 binding one Fab′, NC10 scFv-5 binding two Fab's and the NC10 scFv-0 binding three Fab′ molecules, as shown in 2 Table 2 and FIG. 9. The linearity of the ln c versus r plots of the sedimentation data (FIG. 9) showed that the complexes with NC10 scFv-15 monomer and NC10 scFv-5 dimer were homogeneous, and that discrete and stoichiometric complexes were formed. The equilibrium data for the complex with NC10 scFv-0 showed a very slight curvature on linear transformation (FIG. 9). The fit to the data yielded an average M r of 212,000, which corresponds closely to the expected Mr for a complex of three Fab′ binding per NC10 scFv-0 (Table 2). The slight curvature of the transformed data may indicate a small degree of dissociation of the complex under the experimental conditions. The result with the NC10 scFv-5 confirmed that the dimer is bivalent,as illustrated in FIG. 8b, and that the NC10 scFv-0 with no linker is a trimer with three active antigen binding sites, as illustrated schematically in FIGS. 8c and 8 d.
It will be appreciated that FIG. 8 represents a schematic representation of the complexes, and that there is considerable flexibility in the linker region joining the scFvs, which cannot be depicted. Note, however, that the boomerang-shaped structure (FIG. 8 b), rather than a linear structure, can readily accommodate the 45° angle of projection of the scFv from the plane of the neuraminidase required for four dimers to cross-link simultaneously two neuraminidase molecules in the 'sandwich′ complex as indicated in FIG. 8a. Similar flexibility of a different scFv-5 dimer has recently been modelled (Holliger et al, 1996), but has hitherto not been demonstrated experimentally. Electron micrographs of the NC10 scFv-5 diabodies complexed with two anti-idiotype 3-2G12 Fab molecules (M r 156 kDa) showed boomerang-shaped projections with the angle between the two arms ranging from about 60°-180°, as shown in FIG. 16. 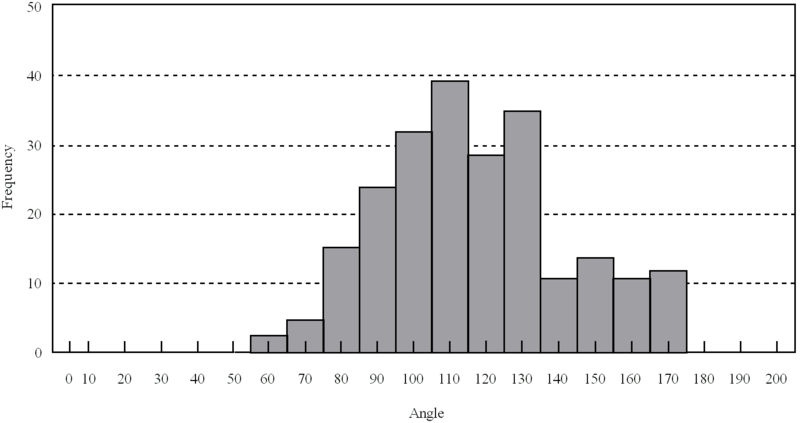 The mean angle was 1220, with an approximately normal distribution of angles about the mean (Table 3). Each arm corresponds to an Fab molecule (FIGS. 1 and 8b), and, despite the potential ‘elbow’ flexibility between Fv and C modules, appears as a relatively rigid, linear molecular rod which extends outwards from the antigen binding sites. Linearity of the Fab arms under the current imaging conditions was confirmed by the appearance of free 3-2G12 anti-idiotype Fabs imaged in conjunction with triabodies. The variation in the angle between the arms indicates that there is considerable flexibility in the linker region joining the two scFvs in the diabody. Measurements of the arm lengths are summarized in Table 3. In a series of experiments anti-idiotype 3-2G12 Fab′ and the NC 10 scFv-15 monomer, scFv-10, scFv-5 and scFv-0 were also immobilised at pH 4.0 via their amine groups. Binding analyses were performed in HBS buffer (10 mM HEPES, 0.15 M NaCl, 3.4 mM EDTA, 0.005% surfactant P20, pH 7.4) at a constant flow rate of 5 μl/min. The starting template for construction of the short Tinkered scFvs was the zero-linked NC10 scFv-0 gene construct in the vector pPOW as described in Example 1, in which the 5′ end of the V L sequence is linked directly to the 3′ end of the VH sequence. The constructions were designed to add nucleotides coding for one, two, three or four glycine residues between the 3′ end of the VH and the 5′ end of the VL sequence. Four sets of complementary oligonucleotide primers were synthesised as shown in Table 5 to add the extra codons between the V H and VL sequences, using the QuikChanger™ Site-Directed Mutagenesis procedure (Stratagene Cloning Systems, La Jolla, Calif.). using QuickChange ® Mutagenesis. Additional glycine codons shown in lowercase. Construct Complementary Oligonucleotide Pair SEQ ID NO. 15 ng NC10 scFv-0 DNA was subjected to PCR in a 50 μl reaction volume containing 5 μl reaction buffer supplied with the kit, 20 pmoles of the complementary oligonucleotide primers, 2.5 nmoles of each dNTP, and 2.5 units Pfu DNA polymerase. Thermal cycling conditions were: (95° C., 30 secs) 1 cycle; (95° C., 30 sec; 55° C., 1 min;68° C. 12 min) 18 cycles. 1 μl Dpn I restriction enzyme (10 U/μl) was added to each sample and incubated at 37° C. for 90 min to digest dam methylated, non-mutated parental DNA. 2 μl of each reaction mixture was used to transform electrocompetent XL1-Blue cells (recA endA 1 gyrA96 thi-1 hsdR17 supE44 relA1 lac [f′ proAB lacI qZΔM15 Tn10 (tetr)]) (1×109 cfu/μg), aliquots of which were incubated overnight on YT-amp100 plates at 30° C.
Mutants containing the correct nucleotide insertions were selected by DNA sequencing of plasmid DNA from a number of individual colonies across the region targeted for mutation, using Sequenase ver 2.0 (US Biochemicals) and the oligonucleotide primer TACATGCAGCTCAGCAGCCTGAC (SEQ ID NO. 17). Clones having the correct mutations were subjected to small scale expression in 5 ml 2YT/amp 200 as described in Malby et al (1993) to confirm that the construct could produce a full length, in-frame product. Culture samples were analysed by SDS-PAGE and Western Blot with anti-FLAG® M2 antibody. The selection criterion was a positive reaction at the correct migration position. One positive clone was selected from this screen for each of the four constructions. Aliquots of affinity purified NC10 scFv-1, scFv-2, scFv-3, scFv-4 were individually analysed by FPLC on a calibrated Superose 12 column. Elution profiles are shown in FIG. 11. NC10 scFv-1 and scFv-2 yielded a major peak eluting in the position of a trimer, similar to that described for scFv-0. The position of the major eluting peak for scFv-3 and scFv-4 was the same as that observed for a dimer, as seen for scFv-5. These results indicate that the extension of the linker from 2 to 3 glycine residues between the V H and VL domains of NC10 is sufficient to allow the preferred multimerisation state of the scFv to change from trimer (as is seen with scFv-0) to dimer (as is seen with scFv-5). The V H and VL genes were amplified by PCR from the parent 11-1G10 hybridoma, and joined into an scFv-0 gene by ligation between codons for C-terminal VH-Ser113 and N-terminal VL-Gln1 by PCR overlap-extension. For 11-1G10 the zero-linkered scFv is defined as the direct linkage of VH-Ser113 to VL-Gln1. The scFv-0 gene was cloned into the Sfil-Notl sites of the expression vector pGC which provides an N-terminal pelB leader sequence and C-terminal FLAG octapeptide tag tail (Coia et al, 1996). The entire DNA sequence of the cloned scFv-0 insert was determined using DNA purified by alkaline lysis and sequencing reactions performed using the PRISM Cycle Sequencing Kit (ABI). This confirmed that the 11-1G10 scFv-0 gene comprised a direct ligation between codons for the C-terminal VH-Ser113 and N-terminal VL-Gln1. HB101  E. coli containing the scFv-0 gene in pGC were grown in 2× YT supplemented with 100 μg/ml ampicillin and 1% glucose at 37° C. overnight and then subcultured in the absence of glucose at an A600 of 0.1, and grown at 21° C. until A600 was 1.0. Expression was induced by addition of IPTG to 1 mM and cells cultured for 16 hours at 21° C. under conditions which release the contents of the periplasmic space into the culture supernatant, presumably by cell lysis, to yield soluble and biologically active scFv (Coia et al, 1996). Cells and culture supernatant were separated by centrifugation, and samples of cell pellet and supernatant were analysed on a 15% SDS-PAGE gel, followed by Western blot analysis using M2 anti-FLAG antibody (Kortt et al, 1994) and goat anti-mouse IgG (H+L)HRP (BioRad) as the second antibody to visualise the expressed product. The expressed scFv-0 was purified from supernatant by precipitation with ammonium sulphate to 70% saturation at 21° C. followed by centrifugation at 10000 g for 15 minutes. The aqueous phase was discarded, and the pellet resuspended and dialysed in PBS at 4° C. overnight. Insoluble material was removed by centrifugation at 70,000 g and the supernatant was filtered through a 0.22 μm membrane and affinity purified on either an M2 anti-FLAG antibody affinity column (Brizzard et al, 1994) or an NC41 Fab Sepharose 4B affinity column. The affinity resin was equilibrated in TBS (0.025M Tris-buffered saline, pH 7.4) and bound protein was eluted with gentle elution buffer (Pierce). The scFv-0 was concentrated to about 1 mg/ml, dialysed against TBS and stored at 4° C. SDS-PAGE analysis of the affinity purified scFv-0 revealed a single protein band of 27 kDa which on Western analysis reacted with the anti-FLAG M2 antibody (FIG. 12). N-terminal sequence analysis of the 27 kDa protein gave the expected sequence for the N-terminus of the 11-G10 V H domain, and confirmed that the pelB leader sequence had been correctly cleaved. The affinity-purified 11-1G10 scFv-0 was as described in Example 5. For the other proteins described in this example, the 11-1G10 scFv-15 (comprising a 15 residue linker in the orientation V H-(Gly4Ser)3-VL) was synthesised under similar conditions to the scFv-0 described in Example 5 above. The 11-1G10 scFv-15 was isolated by gel filtration as a 27 kDa monomer and shown to be stable at 4° C. for several weeks, similar to previous studies with different scFv-15 fragments. NC41 and 11-1G10 Fab fragments were prepared by proteolysis from the parent hybridoma IgG as described previously in this specification. 11-1G10 scFv-0 and scFv-15 were fractionated by size exclusion FPLC on either a Superdex 75 HR10/30 column or a Superose 12 HR10/30 column (Pharmacia) in PBS to determine the molecular size and aggregation state. Gel filtration of affinity purified scFv-0 by FPLC on either a Superdex 75 column (FIG. 13) or a Superose 12 column (FIG. 14) revealed a single peak of M r ˜85 kDa consistent with the calculated molecular mass of a trimer (calculated Mr 79.4 kDa). Gel filtration of the scFv-0 preparation showed no evidence of monomers and dimers, and no evidence of proteolytic degradation to single V-domains. Sedimentation equilibrium analysis indicated that the scFv-0 migrated as a distinct species with Mr ˜85 kDa (Table 6), consistent with a trimeric conformation, and there was no evidence for a dimeric species which might exist in rapid equilibrium with the trimer species. In comparison, the scFv-15 fragment of 11-1G10 (comprising a 15 residue linker in the orientation V H-(Gly4Ser)3-VL) was also synthesised using the pGC vector in HB2151 E.coli cells, and then purified as a stable monomer with a Mr ˜27 kDa determined by gel filtration and sedimentation equilibrium (FIG. 13). Previous examples have shown gel filtration and sedimentation equilibrium studies of NC10 scFv fragments that revealed that scFv-15 monomers possessed an Mr -27 kDa, scFv-5 dimers Mr ˜54 kDa and scFv-0 trimers Mr ˜7OkDa. Thus, the calculated and experimental Mr of ˜27 kDa for monomeric scFv-15 derived from both 11-1G10 and NC10 antibodies were almost identical, whereas scFv-0 from 11-1G10 exhibited a Mr ˜85 kDa slightly larger than that predicted for a trimer (79 kDa) and scFv-0 from NC10 a Mr 70 kDa slightly smaller than a trimer. Gel filtration analysis by FPLC on a Superose 12 column showed that all the scFv-0 interacted with NC41 Fab to form a stable complex of M r ˜245 kDa (FIG. 14), whilst scFv-15 monomer interacted with NC41 Fab to form a stable complex of Mr ˜79 kDa (not shown). The molecular masses of these complexes were determined by sedimentation equilibrium analysis to be 262 kDa and 78.6 kDa respectively (Table 6). Furthermore, both isolated complexes were stable to dilution and freezing (data not shown). These data are consistent with the trimeric scFv-0 binding three Fab molecules whilst the monomeric scFv-15 formed a 1:1 complex with Fab. Comparison of the binding of scFv-15 monomer and scFv-0 trimer to immobilised NC41 Fab by BIAcore™ (FIG. 15) showed that the apparent dissociation rate of the scFv-0 trimer/NC41 Fab complex (kd ˜8.2×10−5 s−1) was approximately 4-fold slower than that for the scFv-15 monomer/NC41 Fab complex (kd˜3.2×10−4 s−1) The 4-fold reduced apparent dissociation rate for the 11-1G10 scFv-0 trimer is similar to earlier Example 5 for the NC10 scFv-0 trimer, and can be attributed to multivalent binding which results in the increased functional affinity for both scFv-0 trimers. The NC10 scFv-0 (V L-VH) gene encoded the pelB leader immediately followed by the N-terminal residues of DIEL for the VL gene. The C-terminus of the VL gene encoded residues KLEIR107 (where R is unusual for VL). The N terminus of the VH (residues QVQL) immediately followed to form a linkerless construct. The C-terminus of the VH terminated with residues VTS112, and was immediately followed by a C-terminal FLAG™ sequence for affinity purification. The NC10 scFv-0 VL-VH gene was, then subcloned and expressed in the heat inducible expression vector pPOW using methods described in Kortt et al, 1994 and Examples 1-4 above. The isolation of NC10 scFv-0 (VL-VH) from the E. coli cell pellet required extraction and solubilisation with 6M GuHCl, preliminary purification using a Sephadex G-100 column, and affinity purification using an anti-FLAG M2 affinity column, using methods described in Kortt et al, 1994. SDS-PAGE and Western blot analysis of purified NC10 scFv-0 (V L-VH) gave a major protein band at ˜30 kDa. FPLC analysis of purified scFv-(VL-VH) on a Superose 12 HR10/30 column (Pharmacia) run at a flow rate of 0.5 ml/min gave a major protein peak eluting at 22.01 minutes with a distinct shoulder on the trailing edge of the peak (FIG. 17). The NC10 scFv-0 (VL-VH) trimer eluted at 23.19 minutes on this column. FPLC analysis on two Superose 12 HR10/30 columns linked in tandem separated two protein peaks from the affinity-purified NC10 scFv-0 (VL-VH), with apparent molecular masses of 108 kDa and 78 kDa. On SDS-PAGE and Western blot analysis both these peaks yielded a band at ˜30 kDa. The FPLC analysis using the two Superose columns demonstrated that NC10 scFv-0 (VL-VH) forms both trimers (Mr ˜78 kDa) and tetramers (108 kDa) which are stable and can be isolated on gel filtration. Purified NC10 scFv-0 (V L-VH) tetramer and NC10 scFv-0 (VL-VH) trimer reacted with anti-idiotype 3-2Gl2v Fab to yield complexes of 4 Fab/tetramer and 3 Fab/trimer, demonstrating the tetravalent and trivalent nature of the two NC10 scFv-0 (VL-VH) molecules. EM analysis of complexes of the isolated NC10 scFv-0 VL-VH trimer and tetramer complexed with 3-2G12 anti-idiotype Fab showed images of tripods and crosses consistent with the trimers having 3 functional TBRs and the tetramers having 4 active TBRs, as shown in FIGS. 16c and d.
The entire DNA sequences of the cloned scFv-0 inserts were determined using DNA purified by alkaline lysis and sequencing reactions were performed using the PRISM Cycle Sequencing Kit (ABI). This confirmed that the C215 scFv-0 gene comprised a direct ligation between codons for the C-terminal V H-Ser121 and N-terminal VL-Glul. HB101  E. coli expression of the C215 scFv-0 was performed as detailed in Example 7 The C215 scFv-0 was concentrated to about 1 mg/ml, dialysed against TBS and stored at 4° C. SDS-PAGE analysis of the affinity purified scFv-0 revealed a single protein band of Mr ˜28 kDa which on Western analysis reacted with the anti-FLAG M2 antibody. N-terminal sequence analysis of the Mr ˜28 kDa, protein gave the expected sequence for the N-terminus of the C215 VH domain, and confirmed that the pelB leader sequence had been correctly cleaved. Gel filtration of affinity-purified C215 scFv-0 by FPLC on a calibrated Superose 12 column (HR10/30) revealed a major peak of M r -85 kDa, (an apparent trimer) with a retention time of 20.20 mins.as shown in FIG. 18. SDS PAGE of the scFv-0 preparation showed no evidence of proteolytic degradation to single V-domains. C215 scFv-5 ran as a dimer (not shown). Construction of Three Discrete Bispecific Ig-like V Domains which are Designed to Assemble into Trimers with Three Different Binding Specificities: CTLA-4-0 Linked to CD86, CTLA-4-0 Linked to UV-3 V L and UV-3 VH-0 Linked to CD86. The Ig-like V domains were separately amplified by PCR from the parent coding region with appropriate oligonucleotides pairs which are listed in table 6: #4474/#4475(UV-3 V H), #4480/4481 (UV-3 VL), #4470/#4471 (human CTLA-4)(Dariavach 1988), #4472/#4473 (CD86 V domain) respectively. Human CTLA-4 and CD86 (Aruffo and Seed 1987) were joined into a 0-linker gene construct by a linking PCR with oligonucleotides #4470 & #4473. Human CTLA-4 and UV-3 V L were joined into 0-linker gene construct by a linking PCR with oligonucleotides #4478 & # 4471 and UV-3 VH and human CD86 were joined into 0-linker gene construct by a linking PCR with oligonucleotides #4474 & #4477. This produced ligation between codons for C-terminal UV-3 VH-Ala114and N-terminal CD86-Ala1 by PCR overlap-extension. The Ig-like V domain 0-linker gene constructs were cloned into the Sfi1-Not1 sites of the expression vector pGC, which provides an N-terminal pelB leader sequence and C-terminal FLAG octapeptide tag tail (Coia et al, 1996). Ligation between codons for C-terminal CTLA-4′-Ala112and N-terminal CD86-Ala112 by PCR overlap-extension produced Ig-like V domain 0-linker gene constructs which were cloned into the Sfil-Notl sites of the expression vector pGC. Ligation between codons for C-terminal CTLA-4-Ala112and N-terminal UV-3-VL-Glu1 by PCR overlap-extension was used to produce the Ig-like V domain 0-linker gene construct, which was cloned into the Sfi1-Not1 sites of the expression vector pGC. The C-terminus of the VL was immediately followed by the FLAG™ sequence for affinity purification. The entire DNA sequence of the cloned Ig-like V domains with 0-linkers was determined, using DNA purified by alkaline lysis and sequencing reactions performed using the PRISM Cycle Sequencing Kit (ABI). This confirmed that the Ig-like V domain 0-linker gene constructs comprised direct ligation between codons for each of the domains. Expression was as described in Example 5. Gel filtration of affinity-purified CTLA-4-0-CD86, CTLA-4-0-UV-3 V L or UV-3 VH-0-CD86 by FPLC on a calibrated Superose 12 column revealed major peaks at ˜20.00 mins for each construct (data not shown),consistent with the retention time of trimer. 8M urea or other disaggregating reagents are used to dissociate and prevent the formation of homotrimers. Mixing the purified CTLA-4-0-CD86, CTLA-4-0-UV-3 VL and UV-3 VH-0-CD86 Ig-like V domains and removing the disaggregating reagent by gel filtration or dialysis forms the trispecific trimer. A: An scFv comprising V H-L-VL where L is a linker polypeptide as described by Whitlow et al and WO 93/31789; by Ladner et al, U.S. Pat. No. 4,946,778 and WO 88/06630; and by McCafferty et al and by McCartney et al. B: A single polypeptide V H-Ll-VL-L2-VH-L3-VL which forms two scFv modules joined by linker polypeptide L2, and in which the VH and VL domains of each scFv module are joined by polypeptides L1 and L3 respectively. The design is described by Chang, AU-640863 and by George et al. D: This design of PCT/AU93/00491, which is clearly different to A, B and C above. A single scFv molecule V H-L-VL comprises a shortened linker polypeptide L which specifically prevents formation of scFvs of the type A, B or C, and instead forces self-association of two scFvs into a bivalent scFv dimer with two antigen combining sites (target-binding regions; TBR-A). The association of two different scFv molecules will form a bispecific diabody (TBRs-A,B). Linkers of less than 12 residues are too short to permit pairing between V H and VL domains on the same chain, and have been used to force an intermolecular pairing of domains into dimers, termed diabodies (Holliger et al, 1993, 1996; Zhu et al, 1996; PCT/AU93/00491; WO 94/13804; WO 95/08577). Holliger et al, 1993, 1996, Wo 94/13804 and WO 95/08577 described a model of scFv diabodies with VH domains joined back-to-back, and suggested that these structures required a linker of at least one or two residues. This model was confirmed in a crystal structure of a 5-residue diabody (Perisic et al, 1994), but it was noted that scFv-0 could not be fitted to this conformation, even with severe rotations of the VH domains. Desplancq et al, (1994) described a series of scFvs with linkers of 10, 5 and zero residues, and concluded on the basis of FPLC analyses that these scFvs were predominantly dimers with minor amounts of monomer. Alfthan et al (1995) also reported that scFvs with small linkers, down to 2 residues in length, formed dimers. McGuinness et al(1996) claimed that bispecific scFv-0 molecules were diabodies and could be displayed and selected from bacteriophage libraries. However, none of these studies performed precise molecular size determination on the expressed soluble products to confirm whether dimers were actually formed. We have now discovered that the NC10 scFv-0 yielded a molecular mass on FPLC and sedimentation equilibrium analysis of 70 kDa, significantly higher than expected for a dimer (52 kDa), and less than that for a trimer (78.5 kDa) (Table 2). Binding experiments with anti-idiotype 3-2G12 Fab′ showed that the scFv-0 formed a complex of M r of 212 kDa, consistent with three Fab′ fragments binding per scFv-0. This result confirmed that the 70 kDa NC10 scFv-0 was a trimer, and that three pairs of VH and VL domains interact to form three active antigen-combining sites (TBRs). This scFv-0 structure showed no propensity to form higher molecular mass multimers. The NC10 scFv-0 trimer also bound to neuraminidase, but the arrangement of the antigen combining sites is such that a second antigen binding site on NC10 scFv-0 could not cross-link the neuraminidase tetramers into ‘sandwiches’, as shown for the scFv-10 and scFv-5 dimers in FIG. 8. 11-G10 ScFv-0 also exclusively formed trimers, which were shown to be trivalent for Fab binding by complex formation in solution (Table 4). NC10 scFv-0 (VL-VH) also formed trimers (FIG. 17). A computer graphic model, shown in FIG. 2, was constructed for a zero residue-linked scFv trimer, based on the NC10 scFv coordinates, using circular 3-fold symmetry with the ‘O’ molecular graphics package (Jones et al, 1991), from the coordinates of the NC10 Fv domain in Protein Database entry 1NMB (Malby et al, 1994) and MOLSCRIPT (Kraulis, 1991). Ser 112, the C-terminal residues of V H domains, were joined by single peptide bonds to Asp 1, the N-terminal residues of VL domains. The VH and VL domains were rotated around the peptide bond to minimise steric clashes between domains. The Fv conformation and CDR positions were consistent with the molecule possessing trivalent affinity. The low contact area between Fv modules, across the VH-VL interface, may account for the slightly increased proteolytic susceptibility of NC10 scFv-0 trimers compared to NC10 scFv-5 dimers. Although the protein chemical data could not differentiate between symmetric or non-symmetric trimers, the model clearly demonstrated that zero-linked scFvs could form trimers without interdomain steric constraints. In contrast, dimeric structures have been proposed for scFv-0 in which only V H domains are in contact between Fv modules (Perisic et al, 1994). These dimeric structures impose severe steric constraints when the linker is less than 3 residues in length. Our data show that trimers are exclusively favoured over dimers for both NC10 scFv-0 and 11-1G10 scFv-0. Steric constraints probably prevent the dimer formation and result in the trimeric configuration as the generally preferred conformation for scFv-0 molecules. In conclusion, this specification shows that linkers of 10 or 5 residues joining the NC10 V H and VL domains result in the exclusive formation of bivalent dimers. The pairing of VH and VL domains from different molecules results in non-covalently crossed diabodies. For the scFv-5 and scFv-10 constructs monomers do not form, and any observed monomeric species are proteolytically-produced Fv fragments. The direct linkage of NC10 VH and VL domains as scFv-0 produced a trimer, with three antigen combining sites (TBRs) capable of binding antigen. Previous scFv-0 constructs have been reported to be dimers, which suggests that C-terminus and N-terminus residues in those constructs have some flexibility and may act as a short linker (Holliger et al, 1993). Indeed, the allowed flexibility between Fv modules of a 5-residue linked diabody has recently been modelled (Holliger et al, 1996), and presumably linkers of less than 5 residues would severely restrict this flexibility. We initially thought that the trimeric conformation was unique to NC10 scFv-0, perhaps due to steric clashes between V-domains which prevented the dimeric association. However, we show in this specification that NC10 scFv molecules linked with up to 2 flexible residues between the V-domains also form trimers. We also show that the reverse orientation, for NC10 scFv-0 V L-VH is a trimer, but can also be a tetramer. Furthermore, we show that a second scFv-0 in VH-VL orientation, constructed from the anti-idiotype 11-1G10 antibody, can be a trimer, and possess trivalent specificity. We also show that a third scFv-0 in VH-VL orientation, constructed from the C215 antibody, can also form a trimer. This specification describes methods of producing trimeric scFv-0 molecules constructed by direct ligation of two immunoglobulin-like domains, including but not limited to scFv-0 molecules in V H-VL and VL-VH orientations, and teaches the design of polyspecific reagents. Ig-like V domains of non-antibody origin have also been joined without a linker in a construct equivalent to the scFv-0 to form trimers, and we have shown here the joining of CD86 (Ig-like V domain) to CTLA-4 (Ig-like V domain), as well as joining each of these to UV-3 V H and UV-3 VL respectively. The trimer formation by each of these constructs teaches that polyspecific and in this case trispecifc trimers can form as shown in FIG. 1 Aspect II, with the VH and VL of UV-3 noncovalently associating, the two CD86 Ig-like V domains noncovalently associating, and the two CTLA-4 Ig-like domains noncovalently associating. In the design of the trimeric NC10 scFv-0 residues Ser 112 and Asp1 were ligated as a direct fusion of domains and, presumably, the absence of a flexible linker prevents the dimeric configuration. The C-terminal residue Ser1l2 was chosen from precise structural data, obtained by crystallographic analysis (Malby et al, 1994), as being immediately adjacent to the last residue constrained by hydrogen bonding to the VH domain framework before the start of the flexible hinge region. Similarly, Asp1 of VL was known to be hydrogen-bonded to the V-domain framework and was close to the antigen-binding site, but was not involved in antigen binding. Using a similar rationale, the NC10 scFv-0 VL-VH molecules were synthesised as a direct ligation of the C-terminal VL residue Arg107 to the N-terminal VH residue Gln1 (residues taken from Malby et al, 1994), and shown to associate into a stable trimer by FPLC analysis (FIG. 17). Since there are no structural data for 11-1G10, we assumed from structural homology that direct ligation of V H-Ser113 to VL-Gln1would similarly prevent the formation of a flexible linker, unless there is unfolding of the terminal β-strands from the V-domain framework. The 11-1G10 scFv-0 exclusively formed trimers (FIG. 13), which were shown to be fully active and trivalent for Fab binding by complex formation in solution (FIG. 14). In contrast, the 11-1G10 scFv-15 preferentially formed monomers with a small percentage of dimers, consistent with most previous observations of scFv-15 structures. The slight difference between calculated and experimental molecular masses determined by gel filtration and sedimentation equilibrium is within the usual error range for these analytical methods (Table 5). As expected, binding experiments with the immobilised NC41 Fab on the BIAcore biosensor showed that the trimer had a slower dissociation rate compared to the monomer, which can be attributed to the increased avidity of multivalent binding (FIG. 15). Taken together, our examples of scFv-0 molecules demonstrate that directly ligated V H-VL or VL-VH domains form trimeric scFv-0 molecules and in some cases, form a tetramer. The residues chosen for ligation of VH-VL or VL-VH should be close to the V-domain framework, and can either be determined experimentally, or can be predicted by homology to known Fv structures (Malby et al, 1994). Presumably, additional residues that form a more flexible linker will allow the formation of diabodies (Holliger et al, 1993; PCT/AU93/00491; WO 94/13804; WO 95/08577). The design of bivalent diabodies directly led to the design of bispecific diabodies using dicistronic vectors to express two different scFv molecules in situ, V HA-linker-VLB and VHB-linker-VLA, which associate to form TBRS with the specificities of the parent antibodies A and B from which the V-genes were isolated (Holliger et al, 1993, 1996; WO 94/13804; WO 95/08577). The linker sequence chosen for these bispecific diabodies, Gly4Ser, provided a flexible and hydrophilic hinge. In a similar process, and using the inventive steps described in this specification, tricistronic vectors can be designed to express three different scFv-0 molecules in situ, V HA-VLB, VHB-VLC, and VHC-VLA which will associate to form a trispecific trimer with TBRs equivalent to the parent antibodies A,B,C from which the V-genes have been obtained. The three VH-VL scFv-0 molecules can associate into a trispecific trimer in a schematic configuration similar to that shown in FIG. 2. It will be readily appreciated that purification of the trispecific molecules to homogeneity is likely to require three sequential affinity columns to select either for three active TBRs or to select for individual epitope-tagged molecules. It will also be appreciated that the reverse orientation VL-VH is a suitable alternative configuration. The construction of tricistronic expression vectors will enable the production of trispecific scFv-0 reagents with applications including, but not limited to T-cell recruitment and activation. 1. A polyvalent or polyspecific protein complex, comprising three or more polypeptides which associate to form three or more functional target-binding regions (TBRs), and in which each individual polypeptide comprises two or more immunoglobulin-like domains which are covalently joined together, such that two Ig-like domains in a single polypeptide do not associate with each other to form a TBR. 2. A polyvalent or polyspecific protein complex according to claim 1 in which the immunoglobulin-like domains are linked by a peptide of fewer than 3 amino acid residues. 3. A polyvalent or polyspecific protein complex according to claim 2 in which the immunoglobulin-like domains are covalently joined without a linker peptide. 4. A polyvalent or polyspecific protein complex according to any one of claims 1 to 3, comprising polypeptides in which each polypeptide comprises two or more immunoglobulin-like domains, and in which the domains are covalently joined without requiring a foreign linker polypeptide. 5. A polyvalent or polyspecific protein complex according to any one of claims 1 to 4, in which the polypeptides comprise the immunoglobulin-like domains of any member of the immunoglobulin superfamily. 6. A polyvalent or polyspecific protein complex according to any one of claims 1 to 5, in which the immunoglobulin-like domain is derived from an antibody, a T-cell receptor fragment, CD4, CD8, CD80, CD86, CD28, or CTLA4. 7. A polyvalent or polyspecific protein complex according to any one of claims 1 to 6, comprising different polypeptides, each of which comprises antibody VH and VL domains or other immunoglobulin domains, which are covalently joined preferably without a polypeptide linker, and in which the polypeptides associate to form active TBRs directed against different target molecules. 8. A polyvalent or polyspecific protein complex according to claim 7, which comprises one TBR directed to a cancer cell-surface molecule and one or more TBRs directed to T-cell surface molecules. 9. A polyvalent or polyspecific protein complex according to claim 7, which comprises one TBR directed against a cancer cell surface molecule, and a second TBR directed against a different cell surface molecule on the same cancer cell. 10. A polyvalent or polyspecific protein complex according to any one of claims 1 to 6, comprising two polypeptides which may be the same or different, each polypeptide comprising two or more immunoglobulin-like domains, in which the polypeptides associate to form a trimer with three or more active TBRs directed against different molecules. 11. A polyvalent or polyspecific protein complex according to claim 8, which comprises one TBR directed to a costimulatory T-cell surface moleculeselected from the group consisting of CTLA4, CD28, CD80 and CD86. 12. A polyvalent or polyspecific protein complex according to any one of claims 1 to 11, in which one of the polypeptides is a non-antibody immunoglobulin-like molecule. 13. A polyvalent or polyspecific protein complex according to claim 12, in which the immunoglobulin-like molecule is the immunoglobulin-like molecule extracellular domain of CTLA4 or CD28, or a derivative thereof, or the immunoglobulin-like extracellular domain of B7-1 or of B7-2. 14. A polyvalent or polyspecific protein complex according to either claim 12 or claim 13, in which the immunoglobulin-like domain is an affinity-matured analogue of the natural mammalian sequence of said domain which has been selected to possess higher binding affinity to the cognate receptor than that of the natural sequence. 15. A polyvalent or polyspecific protein complex according to claim 1, comprising a non-immunoglobulin-like domain. 16. A polyvalent or polyspecific protein complex according to any one of claims 1 to 15, in which the TBRs of each of the monomer polypeptides are respectively directed to three separate targets, whereby the complex possesses a plurality of separate specifities. 17. A polyvalent or polyspecific protein complex according to any one of claims 1 to 6, comprising identical polypeptides, each of which comprises immunoglobulin VH and VL domains which are covalently joined preferably without a polypeptide linker, in which the polypeptides associate to form active TBRs specific for the same target molecule. 18. A polyvalent or polyspecific protein complex according to claim 17, comprising identical scFv molecules which are inactive as monomers, but which form active and identical antigen combining sites in the complex. 19. A polyvalent or polyspecific protein complex according to claim 16, comprising different scFv molecules which are inactive as monomers, but which form active and different antigen combining sites in the complex. 20. A polyvalent or polyspecific protein complex according to any one of claims 1 to 19, which is a trimer. 21. A polyvalent or polyspecific protein complex according to any one of claims 1 to 19, which is a tetramer. 22. A polyvalent or polyspecific protein complex according to any one of claims 1 to 21, in which one or more of the polypeptides is linked to a biologically-active substance, a chemical agent, a peptide, a protein or a drug. 23. A polyvalent or polyspecific protein complex according to claim 22, in which any of the polypeptides are linked using chemical methods. 24. A polyvalent or polyspecific protein complex according to claim 22, in which any of the polypeptides are linked using recombinant methods. 25. A pharmaceutical composition comprising a polyvalent or polyspecific protein complex according to any one of claims 1 to 24, together with a pharmaceutically-acceptable carrier. and another TBR of the protein binds specifically to a therapeutic agent suitable for treatment of the pathological condition. 27. A method according to claim 26, in which two different TBRs of the protein are directed against markers of the pathological condition, and a third is directed to the therapeutic agent. 28. A method according to claim 26, in which one TBR of the protein is directed to a marker for the pathological condition or its causative organism, and the remaining TBRs of the trimer are directed to different therapeutic agents. 29. A method according to any one of claims 26 to 28 for treatment of tumours, in which the therapeutic agent is a cytotoxic agent, a toxin, or a radioisotope. 30. A method of diagnosis of a pathological condition, comprising the steps of administering a polyvalent or polyspecific protein according to any one of claims 1 to 24 to a subject suspected of suffering from said pathological condition, and identifying a site of localisation of the polyvalent or polyspecific protein using a suitable detection method. 31. A method according to claim 30 for detection and/or localisation of cancers or blood clots. 32. An imaging reagent comprising a polyvalent or polyspecific protein according to any one of claims 1 to 24. 33. An imaging reagent according to claim 32, in which all the TBRs of the polyvalent or polyspecific protein are directed to a molecular marker specific for a pathological condition, and in which the protein is either labelled with radioisotopes or is conjugated to a suitable imaging reagent. 34. An imaging reagent according to claim 32, in which two TBRs of the polyvalent or polyspecific protein are directed to two different markers specific for a pathological condition or site, and a third is directed to a suitable imaging reagent. 35. An imaging reagent according to claim 32, in which one TBR of the polyvalent or polyspecific protein is directed to a marker characteristic of a pathological condition, a second TBR is directed to a marker specific for a tissue site where the pathological condition is suspected to exist, and a third TBR is directed to a suitable imaging agent. 36. An imaging reagent according to claim 32, in which one TBR of the protein is directed to a marker characteristic of the pathological condition and the remaining TBRs are directed to different imaging agents. 37. An imaging reagent according to any one of claims 32 to 36, in which the polyvalent or polyspecific protein is a trimer or a tetramer. 38. An imaging reagent according to any one of claims 32 to 37, in which the molecular marker is specific for a tumour. ES2272981T3 (en) 2002-05-29 2007-05-01 Basell Poliolefine Italia S.R.L. (CO9-butene polymers and procedure 1 for its preparation. ES2333237T3 (en) 2004-06-16 2010-02-18 Basell Poliolefine Italia S.R.L. Components and catalysts for the polymerization of olefins. BR112013019990A2 (en) 2011-03-10 2017-07-11 Basell Poliolefine Italia Srl polyolefin-based containers. EP0646173A4 (en) 1992-05-22 1997-02-26 Agen Ltd Reagent for agglutination assays. ES2239246T3 (en) 2005-09-16 soluble T cell receptor. ES2234241T3 (en) 2005-06-16 Antibody derivatives multiple purposes. Kipriyanov et al. 1997 Two amino acid mutations in an anti-human CD3 single chain Fv antibody fragment that affect the yield on bacterial secretion but not the affinity.